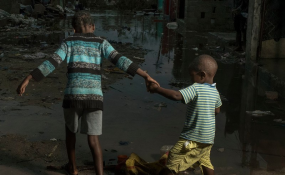 UNICEF has launched an appeal for US$122 million to support its humanitarian response for children and families affected by the storm and its aftermath, in Mozambique, Zimbabwe and Malawi over the next nine months. Copyright © 2019 United Nations Children's Fund. All rights reserved. Distributed by AllAfrica Global Media (allAfrica.com). To contact the copyright holder directly for corrections — or for permission to republish or make other authorized use of this material, click here.